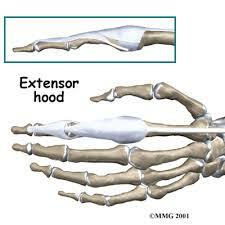 Extensor hood rupture is a rare injury associated with boxing and other professional sports. Extensor tendon rupture occurs secondary to trauma, inflammatory arthroparthies and steroid injection. In boxing, blunt trauma is usually the cause. As the extensor tendons travel over the the metacarpophalangeal joint MCPJ, a dorsal sling of transverse fibers is present. The sling attaches to the extensor tendon dorsally and passes palmarward on each side of the MCPJ joint to attach to the volar plate and the transverse metacarpal ligament. This dorsal sling is called the sagittal band. These transverse fibers are layered in a crisscross pattern that changes its arrangement as the finger flexes and extends. MCPJ joint extension is accomplished by the contraction of the finger extensor tendons and its attachment to the proximal phalanx via sagittal band fibers. The sagittal band acts both as a static tether to prevent radial or ulnar displacement of the extensor tendon and as a dynamic tether that allows proximal and distal gliding of the extensors tendons during flexion and extension. Complete laceration of the sagittal bands on either side can cause instability in the extensor tendon position as it travels across the MCPJ joint. Laceration to the radial side of the sagittal band causes far more instability than injury ulnar side. Complete laceration of one side of the sagittal band causes a subluxation of the extensor tendon to the opposite side of the laceration when the MCPJ joint is flexed. When the MCPJ joint is extended and tension is removed from the Extensor Digiti Minnimi (EDM), the tendon snaps back into the central position. Local tenderness and pain are the first symptoms of the injury. The pain may limit function, but the patient may be able to carry on for a period of time. The clinical assessment would reveal swollen finger and subluxation of the extensor tendon. One study utilized magnetic resonance imaging (MRI) for the diagnosis of ruptured Extensor Hood of the middle finger and it revealed a longitudinal split in the ulnar extensor hood and also in the joint capsule with marked extravasation of contrast. Ultrasonography was used by Willekens et al. in 2 patients with a traumatic injury of the index. Patients underwent a second US evaluation one year following the initial trauma. The injuries of the sagittal bands were seen as a hypoechoic thickening at the side of the extensor tendons. Dislocation of the extensor tendons could be observed. The ultrasound examination one year after the trauma revealed an instability of the extensor tendons. Several studies suggested favorable outcomes associated with surgical repair compared to non-operative treatment. 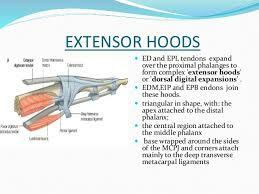 Loosemore & colleagues conducted surgical repair of the extensor hood with (MCPJ) in 90° of flexion and immobilization of the MCPJ in flexion for 4 weeks and reported successful outcomes. To avoid stiffness in Extension the repair was performed with the MCPJ in 90° flexion. The Edinburgh position was utilized for immobilization. For 4 weeks, the MCPJ were placed in 90° flexion with the proximal IP joints in full extension. This position avoids potential shortening, stiffness and contracture. There isn’t much literature regarding rehabilitation after this condition, as for the rare incidence rates. The available evidence concerning surgical rehab, discussed the phases after surgery and related them to most hand repair surgeries with similar outcomes, with boxing specific functions taken into consideration. One of the few reported case studies is of a 20-year-old British male right hand dominant light heavyweight elite boxer who was treated with a surgical repair then immobilized with the MCPJ in 90° flexion and interphalangeal joints (IP) extended for 4 weeks. He was then allowed free active mobilization. Four months following surgery, he achieved full flexion and extension of his MCPJ, which was pain-free. The extensor tendon was central throughout the range of motion. Five months post-surgery, tenderness prevented punching and then he continued with hand and forearm strengthening using squeeze balls, finger bands and free weights. Water-bag punching was reintroduced at 9 months and was increased to heavier water bags in a step-wise manner over a month. Ten months following surgery sparing was introduced. At 12 months he returned to the highest level of international amateur boxing and fought successfully. ↑ 1.0 1.1 Hame SL, Melone CP Jr. Boxer’s knuckle in the professional athlete. Am J Sports Med 2000;28(6):879–82. ↑ 2.0 2.1 Posner MA, Ambrose L. Boxer’s knuckle—dorsal capsular rupture of the metacarpophalangeal joint of a finger. J Hand Surg [Am] 1989;14(2 Pt 1):229–36. doi:10.1016/0363-5023(89) 90011-7. ↑ Ertel AN. Flexor tendon ruptures in rheumatoid arthritis. Hand Clin 1989;5(2):177–90. viii, May. ↑ Chen SK, Lu CC, Chou PH, Guo LY, Wu WL. Patellar tendon ruptures in weight lifters after local steroid injections. Arch Orthop Trauma Surg. 2008 Jun 25. ↑ Doyle JR, Botte MJ. Surgical Anatomy of the Hand and Upper Extremity. Philadelphia, Pa: Lippincott Williams & Wilkins; 2003. ↑ Exhibit, S., Willekens, I., Kichouh, M., & Mey, J. De. (2013). Injuries of the dorsal extensor hood, 1–5. ↑ Arai K, Toh S, Nakahara K, Nishikawa S, Harata S. Treatment of soft tissue injuries to the dorsum of the metacarpophalangeal joint (Boxer’s knuckle). J Hand Surg [Br] 2002;27(1):90–5. doi:10.1054/ jhsb.2001.0656. ↑ Bents RT, Metz JP, Topper SM. Traumatic extensor tendon dislocation in a boxer: a case study. Med Sci Sports Exerc 2003;35(10):1645–7. doi:10.1249/01.MSS.0000089340.89660.EB. ↑ James JIP. Fractures of the proximal and middle phalanges of the fingers. Acta Orthop Scand 1962;32:401–12.